Welcome to Canada's Aviation Hall of Fame giftshop. All items are available on-site. Hard bound with slip cover 9x12 inches, with over 220 full colour and black and white photographs. An attractive matching binder and annual updates on new inductees for the next five years can also be obtained. "This highly attractive and informative work commemorates the 25th anniversary of Canada's Aviation Hall of Fame and provides fascinating biographies of the Hall's current 158 inductees. 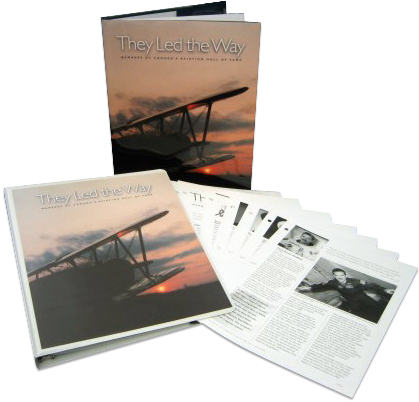 They Led the Way takes the reader through the history of aviation in Canada with stories about those who played an important role in its development beginning with the early aviators who designed the Silver Dart and made the first tentative flights in 1909. There are tales of the barnstormers of the Canadian Prairies of the 1920s and 1930s and of adventures following World War II when aviators explored Canada's vast wilderness working as bush pilots and surveyors, establishing mail routes or merely testing their abilities as entrepreneurs. Also covered are the exploits of Canada's most decorated airmen through two world wars, including the nation's seven Victoria Cross winners for valour in the air. The coveted Aviation Hall of Fame Medal is illustrated and discussed in depth together with a history of Canada's Order of Icarus and a complete roll of the recipients of this premier aviation order." 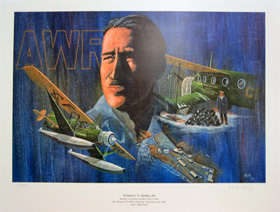 "For the aviation buff or for the collector of aviation awards, this handsome volume is a must. I'm certainly glad there is a copy on my bookshelf!" Stan McMillan with Bellanca CF-AWR at Eldorado, Great Bear Lake, NWT. Each print is individually signed and numbered. Size 24 x 18.